Your visit here is greatly appreciated and we pray that you’ll want to visit us in person as we worship our Lord God Almighty together as one family. We are a family of God’s children who are saved by the grace of God and committed to serving our Lord and our fellow man. We rejoice in the precious gifts the Lord has given us and we’d love to share those gifts and blessings with you. 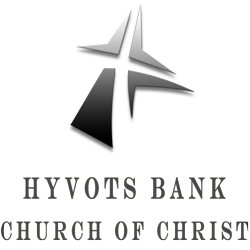 If this is your first time visiting our website and are planning to visit us at Hyvots Bank church of Christ we hope that your visit with us will be refreshing, friendly, and enjoyable for your whole family. We want you to experience inspiring singing, helpful teaching and preaching, friendly people, and a place where you feel welcome and “at home”! We all like sheep, have gone astray, each of us has turned to his own way; and the Lord has laid on him the iniquity of us all.